The Stripeless Heart Baby Blanket! 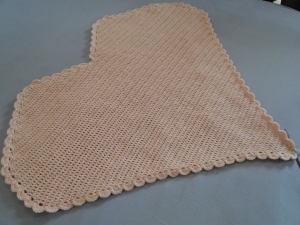 I thought you might like to see some pix of the heart baby blanket without the stripe! I worked this blanket in 100% acrylic, Aran weight, with an H8/5.00mm hook. It's a slightly heavier yarn than the one I used for the main pattern - 100g per ball as before, but 200m length - slightly shorter. This yarn is Bonbon from Nako. The measurements are bigger, here, too - nearly two inches or six centimeters wider and longer. Quite a simple shape - the edging finishes the whole piece off very nicely, I think. Here's another view. What do you think? Do you prefer adding the stripe or not? This is the detail of the bottom point of the heart, as it's quite difficult (for me!) to take a really good pic of the whole blankie. So this lets you see the stitch definition a little better. 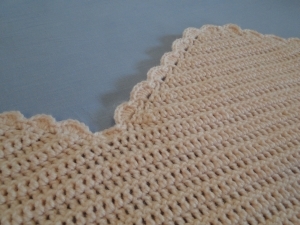 All my ends are sewn in, here, as I finished the blanket with this edging. 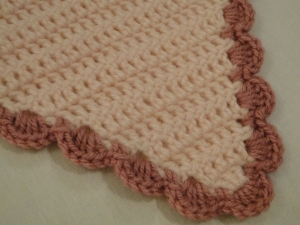 Before this, I'd worked an edging the same color as the blankie - so how did that work out? Well - I have the yarn ends tucked under the blanket in this pic, hence the not-quite-flat appearance! I'm not sure this is the right yarn for a "one color" look. 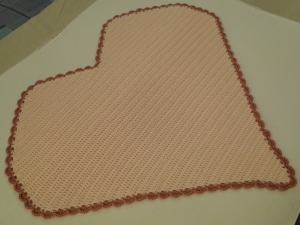 And here is the top of the blanket. You know, for a one color blankie, I might even test out a slightly more lacey edging, to give the whole thing a little more flair. I'll add it to my 'to-do" list! My opinion after having worked the blankie with and without the stripe is that I prefer the stripe for now. 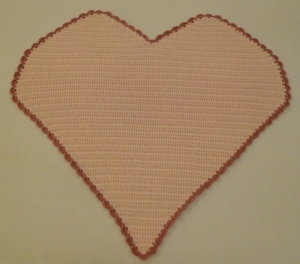 You could always try your own edging, of course - just watch how things go around the top of the heart and in that center stitch at the top as in the photo above. Test, test, and test again - you may end up with a truly original piece!